Someone recently remarked to me that you can think of hardware as software that's developed really slowly. While the software space has been going wild over cloud computing it's been pretty quiet on the hardware side of the equation. But, that's going to change as we see a new class of server hardware that helps businesses take advantage of the power and density savings possible through new CPU architectures and software stacks. 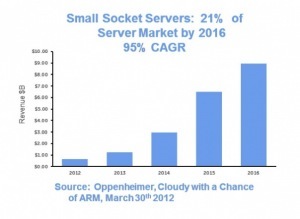 As an illustration IDC reported on the server market recently and it shows the start of the next wave of change. As you'd expect the general server market is pretty poor, growing at just 2.7%. But, blade servers which are commonly used for Web workloads is growing at 7%. Finally, the hyperdense form-factor is growing at 29% - which is an astounding amount. In some ways the drivers for this change are just the continuation of a long-running story where everything is (has?) moved into a Web infrastructure set-up which enables the horizontal scaling of services. Implicitly this favours buying a lot of cheaper systems and building in redundancy at the software level. But the Cloud accelerates this trend further since it's stateless and you no longer care about the specifics of the hardware layer in the same way. The challenge for infrastructure managers is that continually adding more servers means you're incurring ongoing costs for electricity, space and management. So anything that can drive better performance per watt in a denser arrangement is interesting. As you can see from the diagram below the expected growth in this space is really significant. At a CPU architecture level ARM chips have been getting more powerful and this year they're going to enter into the mix for servers. The first reason for this is that they're relatively low-power which means lower running costs. Since they're low power they also give off less heat so another advantage is they can be put into a 'hyperdense' arrangement that also saves money in terms of space. You'll see systems this year from both Dell and HP (see Moonshot). It's pretty astounding to think that the same chip that's powering your phone could be powering Facebook! If we're truly going to get the benefit from the new hyperdense form-factor then the software layer will also need to reflect the capabilities of these systems. So for Ubuntu we're continuing our work on ARM and recently announced the availability of 12.04 LTS as an ARM server - the first commercial Linux to come to the platform. We're also exploring how these hardware systems unique strengths are expressed and how this impacts the software stack. For example if you've got a few hundred systems in a half-rack then the problem of managing those systems is far more significant - so service orchestration (such as Juju) is really critical. It's exciting times in this space and a really interesting project. If you're interested in a quick summary of ARM server check out this Prezi by Victor Palau.